What are the advantages of cleaning and disinfection with foam? When using liquid cleaning or disinfection methods, the efficacy of the product always depends on the interaction between the application time and concentration. Even though a grower can influence the concentration, this is not always the case with the application time. This depends on application techniques and climate conditions. With cleaning foam as a cleaning or disinfection method you can also influence the application time. In this article our specialist explains the advantages of a foam cleaner and disinfectant. Cleaning foam lengthens the application time and with that the efficacy of the treatments, as foam has more adhesiveness. This adhesiveness prevents fast washing away, which makes foam more suitable for disinfecting or vertical surfaces such as greenhouse walls. The creeping capacity of foam also allows difficult to reach surfaces or cornes to be treated. Cleaning foam is a safer choice, because less aerosol is formed by using foam. To spray the cleaning foam use the Menno foam gun. To clean plant sap and organic soiling use Menno Hortisept Clean Plus. To combat algae and bacteria use Menno ter Forte. For broad spectrum disinfection of all plant pathogenic bacteria, fungi, viruses and viroids use Menno Florades. To apply a foam cleaner or disinfectant, you can use several products: a Menno disinfection sprayer, a foam gun or a V1K mobile cleaning unit. The best choice of product depends on (the size of) the surface to be treated. For the best quality cleaning foam it is necessary that a number of requirements are met. The first step is to check and if necessary clean the tank. There should be no residual liquid from other products in the tank, as these can have an effect on the pH value. The water quality also influences the cleaning foam. Use rainwater or osmosis water. If this is not available, and other water (for example tap water) is used, check the pH value beforehand. This value should be ±pH 6, this can be achieved by acidifying (e.g. tap water) to a slightly more neutral pH. This saves on your product consumption. The lower the EC (salt content) the better the foam cleaner. For the foam gun, a pump pressure of 30-45 bar is recommended. 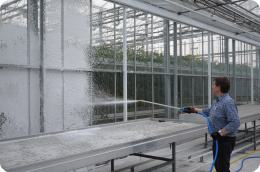 No foaming agent needs to be added, the products Menno Ter Forte, Hortiseptclean PLUS, Menno Florades is by itself foaming at a sufficiently high concentration. For Mennno Florades, the activity is guaranteed at a pH of 3.5 - 4. If the pH is increased by contamination, you can easily add extra Menno Florades until a new pH value of 3.5-4 is reached. You can use various devices to use a foam cleaner as a cleaning or disinfecting product. Do you have questions, need for advice? 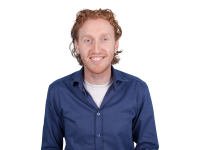 Contact our disinfection specialist Jan Willem Keijzer, or fill in the form below. We'll respond within 24 hours on working days. - How do you reach a bacteria-free watering system? - How do you clean materials? - What is the difference between cleaning and disinfection? - How do you establish a hygiene plan?